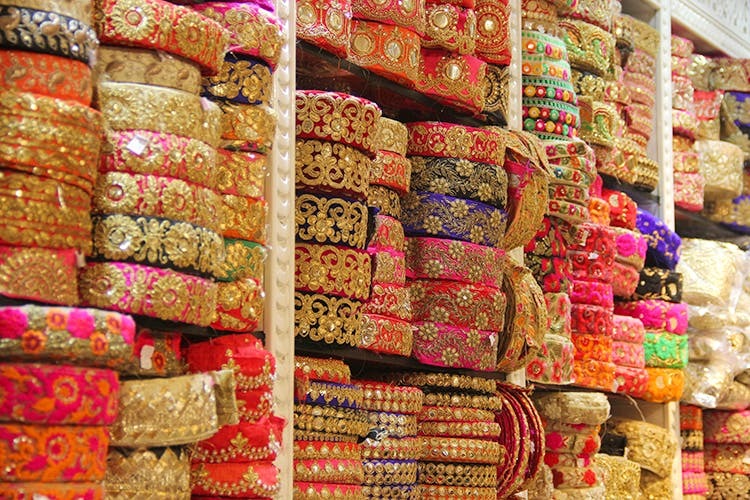 As you walk into the lane from Dariba Kalan, you'll find Kinari Bazaar to be a hub for all things bright and beautiful, and is ideal for wedding shopping or for crafters and DIY-ers, with gullys full of fabric, silver, smoking hot parathas and most of all, bling. We've got a few favourites in this Chandni Chowk bazaar though, the first one being Fancy Lace Collection (2195-96)—a huge store that stocks everything from zari borders, parsi borders, ribbon laces, motifs for saris or kurtas. They don’t sell by the metre, and usually only provide you with nine-metre rolls. Their prices start from INR 30 bucks and can go up to INR 13,000 for nine metres of fabulous gold, silver, neon or traditional borders. While there are tons of tiny shops selling party favours, wedding accoutrement and fancy varmalas, if you like tiny boxes to keep jewellery in, or are looking for tools to help you sew, crochet or embroidery, this is definitely where you should head. We can recommend Sharma Handicrafts (2100) for raw jewellery materials in bone, brass, wood, horn, and a whole lot of buttons. Now, we know that organising stuff into various jars, bottles, hangers and more is our first love, and we came across Kalyan Chand Vineet Kumar Jain, where we struggled to keep our hands off their colourful bird cages, home decor stuff and mini Ferris wheels. They also cater to all parties that require fancy envelopes, dry fruit boxes and lights. At the end of the day, this is Chandni Chowk we're talking about. Expect congested lanes and little breathing space. For those who are unfamiliar with the place, take care of all your belongings, and stay aware of your surroundings. Also, keep yourself hydrated at all times. The road from this lane connects to Paranthe Wali Gali, so you know what to do!